Hey, that’s us on the 2011 VORRA calendar/poster! Desert Dingo Racing, a Class 11 VW team that races the Baja 1000 and off road desert races in California and Nevada, is looking for a couple of new team members. 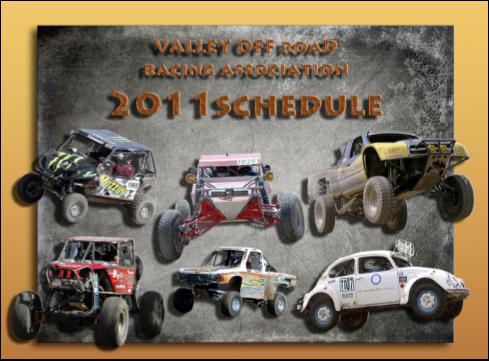 We campaign a Class 11 Stock Bug in the Valley Off Road Racing Association and the Baja 1000. We finished third in class in SNORE in 2009 and second in class in VORRA in 2010. We’ve done the Baja 1000 three times (yet to finish). Class 11s are the slowest of the slow, and yet we’re a fan favorite. If you’re unfamiliar with Stock Bug racing, check out this clip from “Dust to Glory.” Now check out our media coverage. We also raise money for diabetes awareness and education programs in partnership with the International Diabetes Federation. You like signing autographs and look good in a race suit. You want to justify that lifted Tacoma as your daily driver. You have an aversion to grease, bitter cold, sleeping in the dirt, using a catheter or suffer from avian bone syndrome. The idea of spending weeks prepping a 40 year old Volkswagen for a few hours of awesomeness doesn’t sound like a lot of fun. P.S. Honor and recognition in case of success. P.P.S. To qualify as a classified, I’m willing to sell our leftover Volkswagen parts, of which we have many.